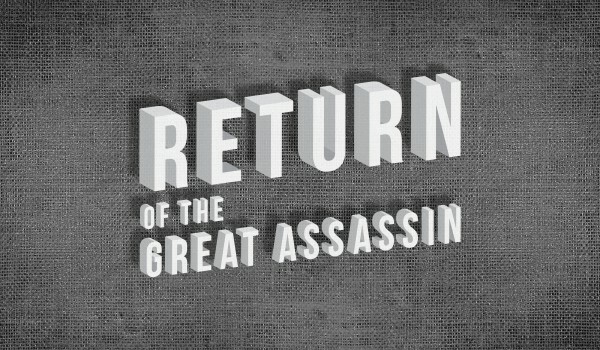 Newbridge Projects presents Return of the Great Assassin, a solo exhibition of Newcastle-born artist Andrew Maughan. The exhibition takes as its starting point the Zodiac Killer, a never-identified serial murderer who operated in California in the 1960s and 1970s. Thanks to cryptic ciphers he sent to the police, the Zodiac was said to be obsessed with movies, and assumed to work in cinemas, lingering in the anonymous nightly gloom of the projection room. Responding to the fear, paranoia, obsessive media interest, and ongoing mystery around the Zodiac, Maughan uses painting to interrogate how such conditions affect the contemporary political landscape. From the poisoning of former Russian spies in Salisbury, to the island mentality driving Brexit, Maughan’s work addresses the sheer absurdity of current events. Drawing on histories of vanitas painting and monumental portraiture, Maughan invests the simple tropes of cinema, street, and summer holiday with surreal humour, through the ambiguous figure of the dark and hairy assassin. Developed while studying at the Royal Academy Schools in London, this new body of work continues Maughan’s interest in the desires and behaviours of middle-class, middle England, and the media that amplifies them.